The first Wastewater Reuse Workgroup meeting for the Long Island Nitrogen Action Plan was held November 9th, 2017 to begin investigating wastewater reuse as a possible means of achieving additional nitrogen removal prior to discharging to groundwater and surface waters on Long Island. 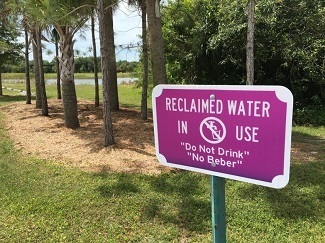 Treated wastewater effluent has been reused around the country and the world for water conservation (to replenish aquifers) and to reduce nutrient inputs to groundwater and surface waters. The introductory meeting was organized to hear perspectives on wastewater reuse and to begin discussing ways to facilitate wider adoption of reuse practices on Long Island. Present were representatives from Federal, State, and County agencies, local engineering firms, environmental, builders’ and civic organizations. This initial discussion covered a wide range of reuse topics including the use of treated municipal wastewater effluent for irrigation of golf courses, parks, landscaped areas, and crops, and industrial uses, such as cooling water; grey water reuse in homes and buildings; augmentation of potable supplies through direct and indirect potable reuse; urine separation; and environmental reuse. The PowerPoint presentation from the meeting is posted on the LINAP Workgroup page. New York Secretary of State, Rossana Rosado announced 16 Long Island South Shore Estuary Reserve (Reserve) Local Assistance Grants totaling $668,385 to municipalities along Long Island’s South Shore for implementation of projects designed to preserve the South Shore Estuary. The grants were awarded to three towns, three villages, and Nassau County, and will fund projects that will be implemented throughout the Reserve. Projects advance the State’s 2001 Comprehensive Management Plan. Kayak launches, shellfish restoration projects, and innovative wastewater treatment systems at two town beaches are among the variety of awarded projects. In a press release, Governor Andrew M. Cuomo announced a $354 million project to significantly improve water quality in the Western Bays of Long Island’s south shore. 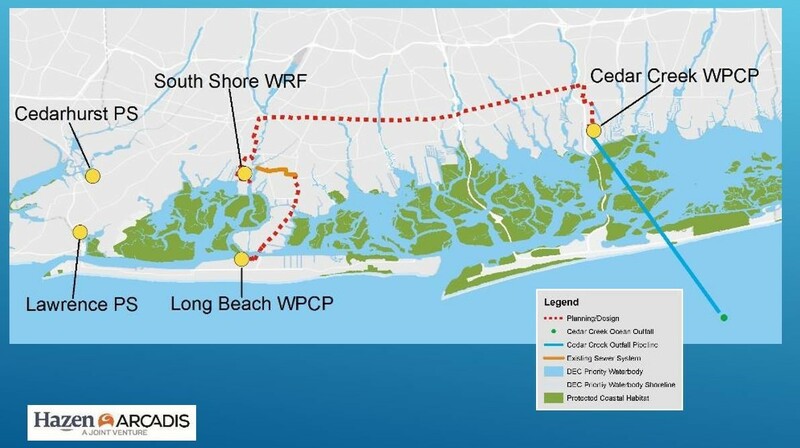 This project will divert treated wastewater from the Bay Park Wastewater Treatment Plant (WWTP) through an abandoned aqueduct under Sunrise Highway to the existing Cedar Creek ocean outfall. The project will prevent the discharge of 19 billion gallons of treated sewage into the Western Bays each year, eliminating harmful nitrogen pollution which will help rejuvenate vital marshlands that protect communities from waves and storm surge. New York State and Nassau County are investing $277 million in the project with the remaining funds being provided by federal sources. The Bay Park WWTP serves more than 500,000 Nassau County residents and discharges an average of 52 million gallons of treated sewage into Reynolds Channel each day. This discharge adversely impacts nearly 10,000 acres of water and tidal marshland in the Western Bays, from Atlantic Beach to Point Lookout, including Hewlett Harbor and Baldwin Harbor. The project will discontinue use of the Reynolds Channel outfall and construct a two-mile, 72-inch connecting pipe system north from Bay Park WWTP to the county-owned aqueduct that runs under State Route 27. The project will also rehabilitate an eight-mile stretch of the aqueduct and slip-line the 72-inch abandoned main with a fiberglass pipe. Additionally, the project will install a two-mile, 72-inch connecting pipe from the aqueduct to the existing Cedar Creek ocean outfall pipe, which is six and a half miles long and will carry treated effluent nearly three miles into the Atlantic Ocean.